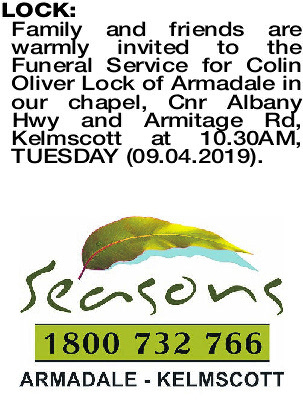 Family and friends are warmly invited to the Funeral Service for Colin Oliver Lock of Armadale in our chapel, Cnr Albany Hwy and Armitage Rd, Kelmscott at 10.30AM, T UESDAY (09.04.2019). 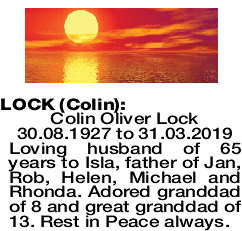 LOCK COLIN Colin Oliver Lock 30.08.1927 to 31.03.2019 Loving husband of 65 years to Isla, father of Jan, Rob, Helen, Michael and Rhonda. Adored granddad of 8 and great granddad of 13. Rest in Peace always. Fond brother-in-law of Ron. Deepest sympathy Isla, Janice, Helen, Rhonda and families. Deepest sympathy to Isla, Janice, Helen, Rhonda and families. Loved brother-in-law of Margaret and Chris (dec). Uncle to Robert, Ryan, Myles, Selina and families. 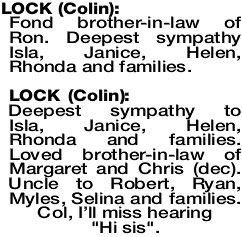 Col, I'll miss hearing "Hi sis". Isla, Janice, Helen, Rhonda and families, we have many happy and fond memories. 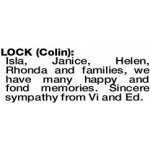 Sincere sympathy from Vi and Ed. 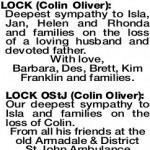 Deepest sympathy to Isla, Jan, Helen and Rhonda and families on the loss of a loving husband and devoted father. With love, Barbara, Des, Brett, Kim Franklin and families. 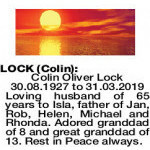 Our deepest sympathy to Isla and families on the loss of Colin. 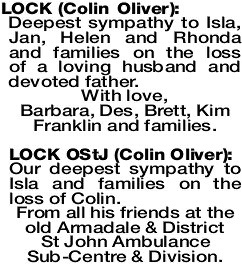 From all his friends at the old Armadale & District St John Ambulance Sub-Centre & Division. 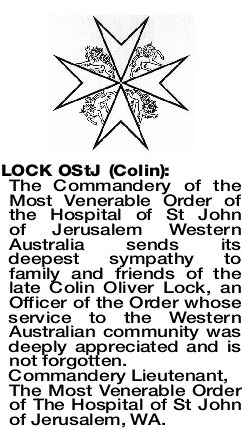 The Commandery of the Most Venerable Order of the Hospital of St John of Jerusalem Western Australia sends its deepest sympathy to family and friends of the late Colin Oliver Lock, an Officer of the Order whose service to the Western Australian community was deeply appreciated and is not forgotten. 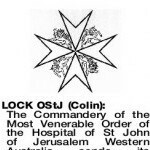 The Most Venerable Order of The Hospital of St John of Jerusalem, WA.